Yep! You heard right! 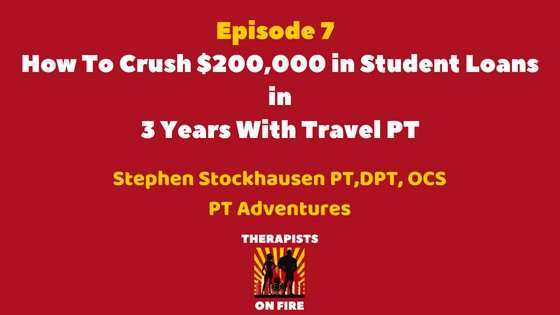 This podcast is about how traveling physical therapy is the number one way to conquer your student loans and how you can beat your loans in just 3 years! Stephen and his wife, Ellen, run the website PT Adventures, which is a site all about their journey as traveling physical therapists, and they are sharing their story today of how they paid off over $200,000 in student loans with travel PT while also still having a life! Special Bonus: PT Adventures created a course to help you negotiate better and earn the salary you deserve as a PT! This is the link to their course page and if you use the code “dfpt20” you can get 20% off of their course. Just $1.00 extra an hour is over $2000 a year so investing a little today should pay dividends in the future! 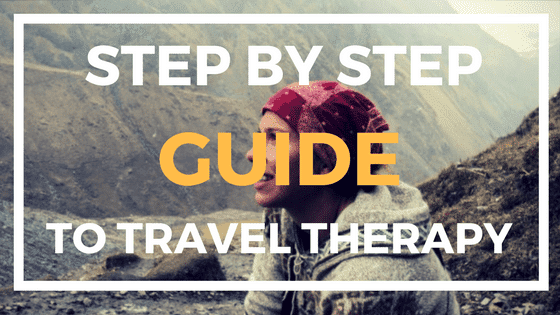 0:45 How Stephen and his wife Ellen became travel physical therapists. Essentially traveling was always dream but it wasn’t a dream they realized they could, or even needed to start, until they worked over two years in outpatient orthopedics. After these two years, they began to see their student debt balloon to $220,000-$240,000! They knew this was just too expensive and that something had to change! They also realized that living was expensive. If they ever wanted to conquer their debt and have the quality of life they wanted, they had to become travelers. 3:11 Their goal for traveling was three-fold: conquer their debt, explore the nation, and afford the cost of living and lifestyle they had always wanted. They realized that their was no other way to get out of their debt! 4:30 People always how much do travelers really make? Steve and his wife each generally take home $70,000-$80,000 grand after taxes. This allowed them to become debt free in just 3 years! -Use the Debt Avalanche method: Essentially, pay off yourloans in order of highest interest rate to lowest interest rate. 8:28 How you totally can still have fun and live life as a traveler! 12:22 Take home pay calculation: This is where I refer to a previous post I’ve made on the true savings therapists make. On $100,000 loan, you will only end up putting $5000 in your savings accountafter cost of living and loan payments if you are also trying to pay off your loans. With traveling, because you make so much more, you can easily pay off your loans plus having savings! -Have a walk away number. Basically a number that is the lowest number you will accept, and if you get any lower than that then you will decline the offer. -For travelers: You won’t get massive raises but there is wiggle room to negotiate.Always try and just ask! -Ask for more if you promise to extend upfront before the assignment starts. -Ask for a raise when you extend, when you change jobs, when you start a new job. -As a traveler, try to ask for these raises as after taxes to earn even more! 17:53 Use arguments to prove your worth and help ensure you will get a raise. -You actually earn $2000 more per contract after just $1 raise/hr. -If you have 3 contracts that’s $8000 more a year. $8000 more a year times 3 years is $24,000 more! -Find work in medium or larger towns. -You have to be more flexible. -Each profession has their own challenges and changes in demand. 21: 17 Is it easier or harder to travel as a couple? -Get to travel together so it’s less lonely. -You have a built in community. -You can save money on lifestyle and split housing. -Home health really enables improved lifestyle and flexibility, especially if you have a family and children. 24:30 Try to keep extending to make more, be less stressed, and save thousands of dollars. -We were able to take 8 weeks off to have our baby and fully fund our lifestyle. We were able to take 6 weeks off for hiking the John Muir Trail. Once you are debt free, you can actually have a family and build a family. Once you don’t have your loan, there are so many different places the money can now go, for example, you can really quickly save up for a down payment to a house. 29:44 How this debt free enabled Steve’s entrepreneurship. 31:50 Stephen’s Elite Level Course: Improve your negotiation, interview and resume skills to score top dollar in your travel assignments or permanent positions. 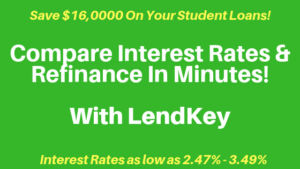 You have to have a plan for your loans because interest on your loans accumulates so quickly. Pay off the highest interest rate loans first! Earning a six figure salary can easily conquer your debt! Travelers can easily earn six figures or more even after taxes! 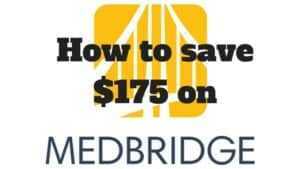 Set aside money specifically for your loans and try to automate this savings. Have a goal for every dollar! You can feel trapped by your student loans and feel burnout out. But once you are debt free, it enables you to explore your secret passions. The Elite Level Course: There are 2 versions, if you are traveler, choose the Travel PT version and if you are a permanent PT then choose the permanent PT course. They have the same information, except the traveler course goes into interviewing for travel positions and travel contracts. To get 20% off of the Elite Level Course, use code “dfpt20” at checkout!